We are thrilled to announce our third season of classical music at Tippet Rise! Starring internationally celebrated performers and outstanding emerging artists from around the world, the summer’s recitals will feature an eclectic and extraordinary mix of beautiful music, including masterworks by J.S. Bach, stunning pieces from the Romantic repertoire, and incredible modern and contemporary works. Season highlights include concerts by cellist David Finckel and pianist Wu Han, co-artistic directors of the Chamber Music Society of Lincoln Center, as well as pianists Yevgeny Sudbin, Anne-Marie McDermott, Pedja Muzijevic and Jeffrey Kahane, four extraordinary string ensembles and other celebrated string players, and the world premiere of Aaron Jay Kernis’s new piece for string quartet, String Quartet No. 4 (musica universalis), the second of a trio of works he is composing for the art center. Concert tickets during Seasons One and Two at Tippet Rise sold out very quickly. To ensure that all music lovers will have an equal chance to purchase tickets, we are holding a random drawing this year. To participate in the drawing, advance registration is required. The registration process will open at 12 PM (noon) Mountain Time on Tuesday, February 20 and close on Monday, March 12 at 5:00 PM Mountain Time. Winners will be selected at random on Tuesday, March 13 and notified by email. Winners may purchase up to four tickets to one performance, or divide tickets among multiple performances. For additional details and to enter the drawing for Season Three, click on the red “Ticket Drawing” link above. Tickets for Season Three’s concerts are $10 each for adults, free to those 21 and under. As ever, tickets are required for all guests, including those 21 and under. 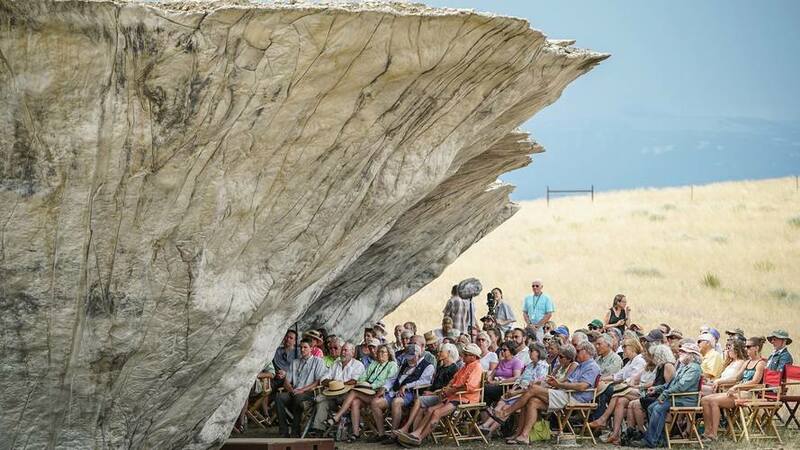 Tippet Rise will reopen for Friday, Saturday, and Sunday sculpture tours on Friday, June 29, 2018, one week before the start of the summer music series. Tours will be available via shuttle van for $10 per person, free to anyone 21 and under. Visitors can also explore the ranch and its sculptures by foot and by bicycle via nine miles of trails and 13 miles of gravel road. Hiking and biking are free, but advance registration is required for all visitors. Registration for sculpture tours opens Wednesday, March 14 at 8:00 AM Mountain Time. For more information about sculpture tours, including hiking and biking, click on “Take a Tour” above. For concert-goers and tour guests, dinner will be available for purchase before each evening’s performance, provided by Cordon Bleu-trained chef Nick Goldman and chef Wendi Reed of Wild Flower Kitchen. Sandwiches, snacks, desserts, and drinks are also available for purchase on Fridays, Saturdays, and Sundays. We are grateful to Nick and Wendi and the Wild Flower Kitchen staff for their incredible fare, featuring all natural, organic and local ingredients whenever possible. For more information about Season Three’s concerts, please click “More info.” We look forward to seeing you at Tippet Rise in 2018!